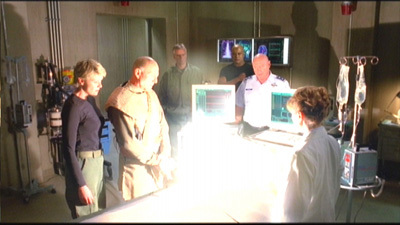 Daniel has been exposed to a lethal dose of radiation, and SG-1 struggles to uncover the circumstances that led to the accident. The team had been visiting Kelowna, one of three major countries on P2S-4C3. The Kelownans had recently discovered an ancient temple containing artifacts and naquadria, an unstable radioactive variation of naquadah with enormous potential as an energy source. The Kelownans are using the naquadria to develop a powerful weapon, and are anxious to trade technology with Earth. However, diplomatic relations ceased when Daniel was injured in a lab accident, and accused of sabotage by the Kelownans. Because of the enormous potential of naquadria for defense technologies, the SGC attempts to reopen diplomatic relations with Kelowna to trade for the mineral. Despite his resentment over the accusations against Daniel, O'Neill delivers a message to Jonas Quinn, the Special Advisor to the High Minister, and forces him to examine his conscience in covering up the actions of his government. Jonas makes the decision to tell the truth, that Daniel was a hero who had risked his life and saved the planet during the accident, and he brings a sample of naquadria to Earth, leaving his planet behind and risking dishonor as a traitor. As Daniel's condition continues to deteriorate, each of his teammates visits him with words of farewell. In a plane between life and death, Daniel also has another visitor, Oma Desala, who offers him a chance for enlightenment through ascension. Daniel hesitates to face the new journey she offers, but as Jacob arrives and makes one final attempt to heal him through the healing device, Daniel chooses enlightenment and convinces O'Neill to let him go. Surrounded by his friends, Daniel passes to a higher plane of existence, his body takes on the non-corporeal form of the Others, and he ascends. During the accident involving unstable radioactive naquadria, Daniel’s right hand was exposed to the equivalent of over 8 to 9 Grays of neutron radiation resulting from direct contact, with full body exposure of over 7 Grays, a lethal dose that would result in death in 10 to 15 hours. Kelowna is one of three major countries on P2S-4C3, with a technological level of development comparable to the 1940’s US. Mounting tensions among the three nations has led to a situation similar to the Cold War. The Kelownans discovered their stargate about 15 years ago, when they discovered an ancient Goa’uld temple with writings, artifacts, and samples of naquadria, which they are developing as a weapon. Kelownan scientists theorized that their civilization had been destroyed by an asteroid impact 10,000 years ago, however the temple writings indicate that Goa’uld experiments with a naquadria weapon were responsible for the destruction. Naquadria is a mineral substance found on Kelowna, a highly unstable radioactive variation of naquadah with the potential for enormous energy production far greater than weapons grade naquadah. It may be the power source needed to generate the energy necessary to create a hyperspace window or energy defense shields. Jonas Quinn, Special Advisor to the High Minister of Kelowna, has several degrees from the most honored education institutions including social studies and ancient Kelownan history, and is responsible for overseeing scientific research from an ethical perpective. Since taking the sample of naquadria to offer to the SGC, he would be considered a traitor if he returned to Kelowna.